I have been eyeing the Craftsman rolling tool chest for awhile. I think one would be VERY useful by the Innova. Last week, I was in Sears to get a tool carrier to schlep around the house..when I spied ...COLORS! Did you know they come in Red (well...DUH!)...orange? HOT PINK? purple? 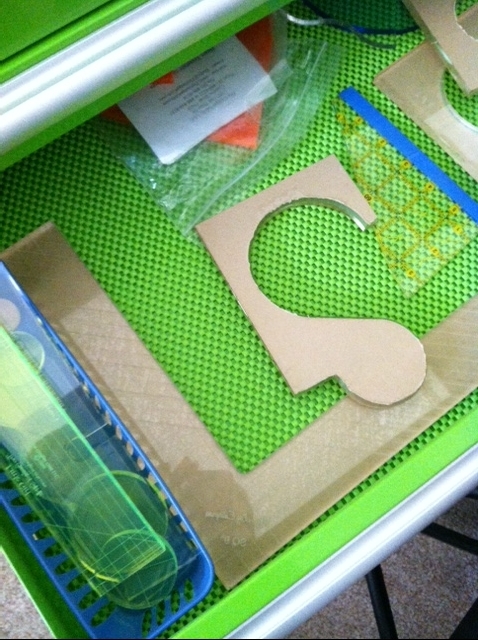 Even the drawer liners match! and here I thought I was a BLUE girl! Who knew! it must be Judy L's influence! I will have to email her to thank her! Oh, I wish you hadn't shown me that! I love it. Now I'm thinking what I might get rid of in my sewing room so I could have room for one. Love it! I didn't know they came in COLORS! I'm adding one to my wish list. I saw this in HOT PINK a few months ago at Sears and I am in love. I've been avoiding Sears like the plague now. I have want a tool box for the past 20 years. 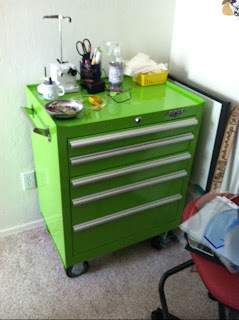 I saw the Kraftman one at Christmas when we went in Sears.I told DH that that would be the perfect tool chest. I was on a disabled budget though and have to get a place rolling one.